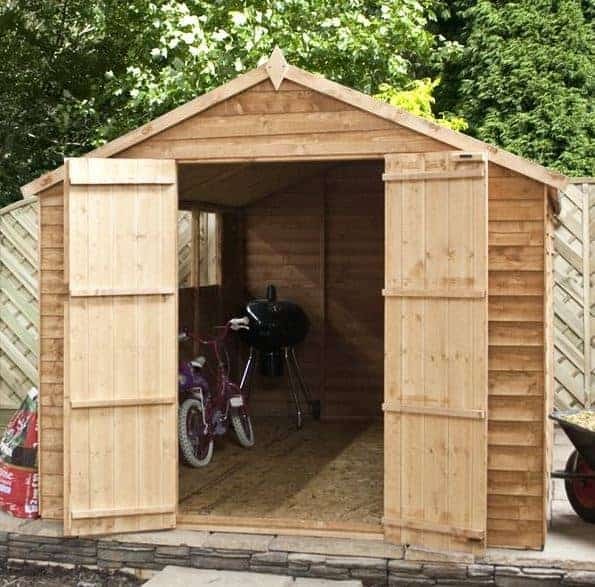 Constructed with good quality overlap cladding, this attractive storage shed by Waltons offers an affordable, large storage space. With a stylish and water-resistant apex roof, it provides excellent year-round protection. Not only that, but the apex feature also brings extra head space into the building, making it more comfortable to use. You can also store tall equipment with ease. 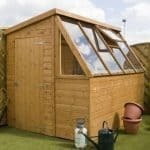 The shed also comes with double framed corners, increasing its strength and stability, while a 10 year anti-rot warranty is provided to give you great peace of mind. Double ledge style doors offer spacious access into the building. Waltons have also included a butterfly catch to make sure they stay closed when you want them to. It also features styrene glazed windows which are stronger than glass and 100% shatterproof. This makes it a safe choice for homes with young children. Built with overlap cladding, you benefit from an affordable yet reliable and durable storage shed. The floor and roof are made from solid sheet materials. 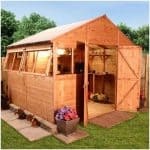 This means that the shed is mainly designed for light to medium weight storage. However, there is an extra strength floor support pack available which will increase its strength, allowing you to store heavier equipment with peace of mind. 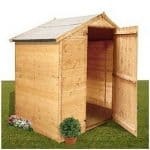 All in all this is a good value, sturdy shed that is suitable for general garden storage needs. Floor isn’t strong enough to support heavy weight items. However, you can upgrade with an extra strength floor support pack if preferred. Doesn’t come with a lock. However, you can easily invest in an affordable good quality lock to rectify this problem. 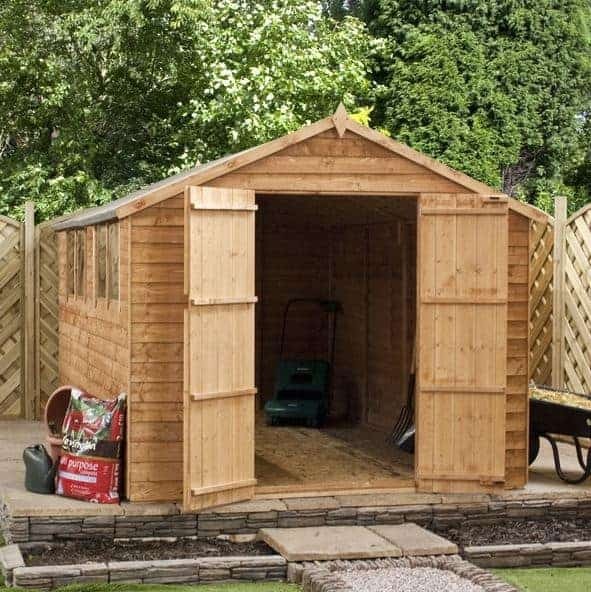 This large, spacious wooden storage shed offers great value for money and comes with a practical, stylish and durable apex roof. The roof is one of the sheds leading features as it provides both aesthetic and protective benefits. On the practical side of things, the roof supplies great weather protection. It is covered with high quality sand felt and as the rain hits, it automatically rolls down and off the shed. This basically means it doesn’t have chance to collect on top of the building and therefore won’t pose a risk of rot or damp related issues. It also increases the amount of height within the shed. So if you’re tall and often find you need to duck down either whilst entering a shed or walking around inside, you’ll enjoy the freedom this roof gives you. The height of the roof totals 2.11m, whilst the eaves measure 1.55m. It also comes with a depth of 3.12m and a width of 2.33m. To ensure you have great access into the building, the doors measure 0.96m wide and 1.68m tall. 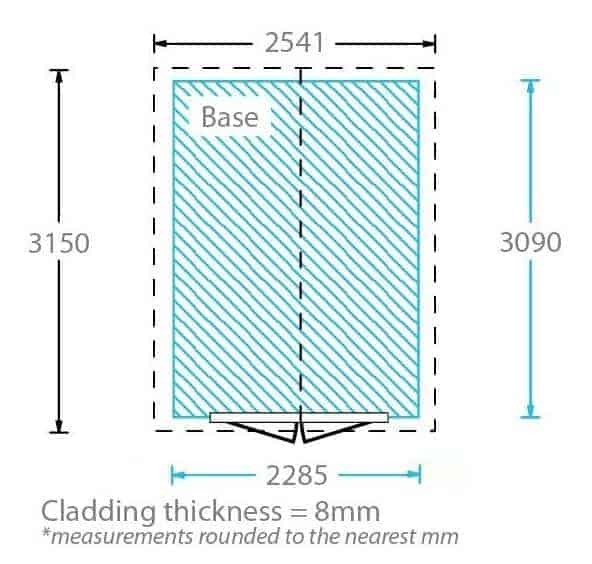 Created with 8mm overlap cladding, you’ll find the building offers a reliable, strong protection against the elements. The reason it is so affordable is because overlap is actually the cheapest and easiest material for manufacturers to use. However, despite being so affordable, overlap cladding is actually really high quality. Just like other materials, if you maintain it properly it will last at least 10 years. To create the overlap effect, 8mm sawn timber boards are nailed on top of each other. You’ll find it has the exact same look as many garden fences. 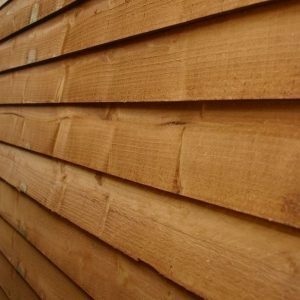 The only thing you need to consider with this style of cladding is that it doesn’t support the weight of hanging heavy items from the shed walls or interior shelving. It is also prone to warp if you assemble it in a really sunny spot. Walton’s uses standard 28mm x 28mm framing which you’ll see from the interior of the shed provides an excellent support for the building. A floor is included, but it is created from 10mm solid sheet materials. Some may find this a little flimsy; particularly if you are planning on keeping anything heavy such as a lawnmower or heavy boxes of tools. However, you do have the option to upgrade which in our opinion is definitely worth doing. An extra strength support pack provides tough joists that slot in-between the existing joists of the floor. This will drastically increase the floor’s strength, allowing you to store heavy tools and machinery with complete reassurance. With overlap sheds you do need to apply a high quality treatment every year. This shed comes with a 10 year anti-rot warranty, but one of the conditions is that you use a spirit based treatment shortly after construction. The reason spirit based treatments are recommended over the cheaper water based ones, is because they give the building a much deeper level of protection. Water treatments are designed to protect the surface of the building. Whilst this will give it a good amount of protection, the spirit treatments provide a full water barrier from the inside of the timber. With Shiplap and tongue and groove clad sheds, you don’t always need to reapply these treatments every year. However, as overlap isn’t as strong even with a good spirit based treatment, it should be reapplied annually. If you’re looking to add colour to the shed, you will find there is more choice with the water based treatments. We recommend using a clear spirit based treatment and then using the water coloured treatment if altering the colour is important to you. The double ledge style doors provide immediate access into the spacious interior and they have a pretty wide design. We like the double door feature as it ensures you have comfortable space to transfer items in and out of the shed. The included butterfly lock also helps to keep them firmly shut, even in heavy winds. As this is big building, Waltons have provided four windows. This ensures you have a lot of natural light, making it easy to find what you’re looking for and manoeuvre around inside without needing a torch! 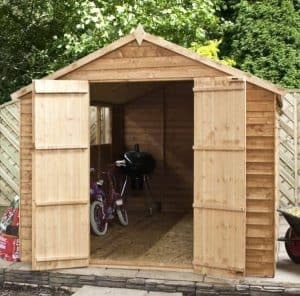 As with most shed’s in the Waltons range, you can also decide whether to install the windows on the left or right of the building. 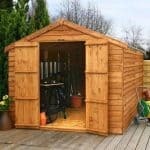 Now if security and privacy are two of your biggest concerns, you will need to spend a little extra money upgrading the shed. This is because whilst the overlap cladding isn’t exactly flimsy, it also isn’t overly difficult to break through. So if a determined thief walks past and tries their luck breaking through the material, they would likely get through with a crowbar. There isn’t a lot you can do to improve the strength of the walls. However, you can invest in a good locking system. The butterfly catch isn’t a lock, so whilst it may keep young children out, it won’t stop even an amateur thief from getting in. The good news is fitting a lock isn’t expensive and there are some pretty great quality ones out there to choose from. Privacy wise, with four windows sadly you won’t get a lot of it. You could install blinds, though a curtain rail wouldn’t be advised due to the overlap cladding. It won’t support the weight of anything heavy hanging on the interior walls. However, small blinds could be an option. You have a lot of choice when it comes to customisation and extras. The main customisation options available are the placement of the windows, a superior duty felt upgrade and an extra strength floor support pack. Being able to choose where you want to install the windows is actually a very good benefit. It means that whilst they do still limit the amount of privacy the shed has, you can install them on the most private side of the garden. The superior duty felt isn’t a necessity as we feel the heavy duty sand felt provides more than enough protection against the elements. 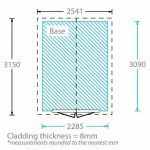 However, if you would like to make the shed as durable as possible, this glass fibre felt will add a pretty tough layer of protection. It is also designed to be extremely easy to fit thanks to its self-adhesive qualities. If you’re building the shed on a very solid base, the extra strength floor support pack may not be needed; especially if you won’t be storing anything overly heavy. However, at just £29.99 we do feel this is a very worthwhile investment. It will give you reassurance in case you need to store anything heavy and will increase the stability of the building too. The most expensive extra is one we actually feel is the most essential. 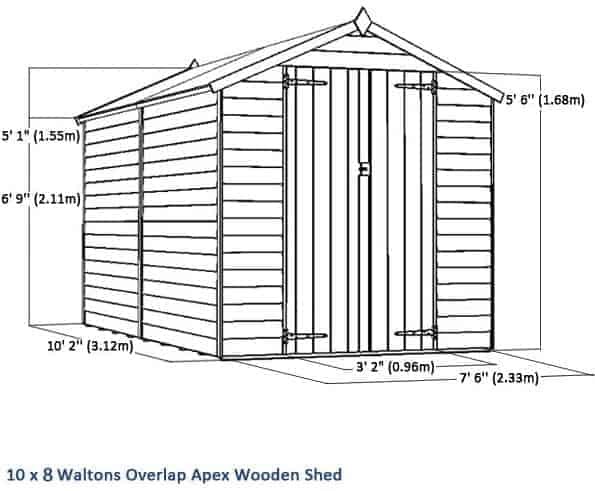 The 10×8 Waltons Portabase gives you an extremely solid base to build the shed on top of. Raising it up off the floor, you won’t have to worry about any potential damp problems. You will also find it easier to build the shed on top of this specialist base. Anything that makes installation easier is definitely worth investing in. What we find most interesting is the shelving kits offered. As mentioned earlier, overlap cladding does not support interior shelving. However, if you invest in the extra strength floor support pack, these standalone kits give you the additional storage space you need. They are made from 16mm tongue and groove cladding so they are strong enough to hold very heavy tools. There are three different sizes available, with most offering a double tier unit. However, there is also a 4ft triple tier shelving unit available. The company also supplies a number of different treatments. It is worth buying these with the shed as you will need to apply a treatment straight after it has been assembled. The overall quality of this building is really good, though it isn’t as tough as a lot of other sheds out there. That’s why we have given it a 7.5 out of 10 rating. Overlap cladding does not provide the same level of protection as other cladding types so it understandably isn’t naturally designed to last as long. However, if you treat the shed regularly it will last against rot for 10 years. This is a very spacious building and it provides a fantastic level of storage. However, if you want to benefit from shelving, you will need to spend a little extra money on the shelving units provided by Waltons. One of the best qualities of this shed is the fact it is so easy to put together. Everything is included, the instructions are easy to read and follow and the panels aren’t very heavy. So it provides a pretty quick and simple installation. 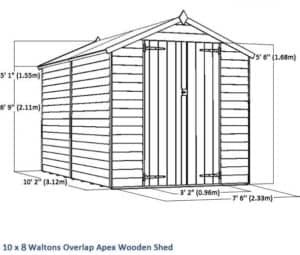 This is one of the best value sheds on offer from Waltons. It comes at an unbelievably low cost and when adequately maintained, it should last against the elements for a minimum of 10 years. 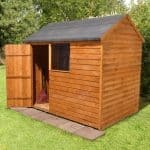 Even with the extras you may need to invest in, this is definitely one of the more cost effective sheds on the market. Final Thoughts: This great wooden overlap shed provides excellent value for money. 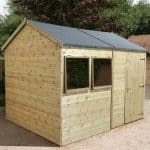 Boasting a strong, reliable design, it is a fantastic entry-level shed that is suitable for light and medium weight storage. You also have the option to upgrade the floor with an extra strength support pack if you want to store heavier equipment. The styrene glazed windows provide plenty of light into the building, though this does compromise security. Therefore we highly recommend you invest in a good quality lock such as the weatherproof padlock available from the manufacturer. If you’re looking for an affordable, basic storage space then this is a fantastic option. It offers a fantastic amount of space and great interior height due to its apex roof design.